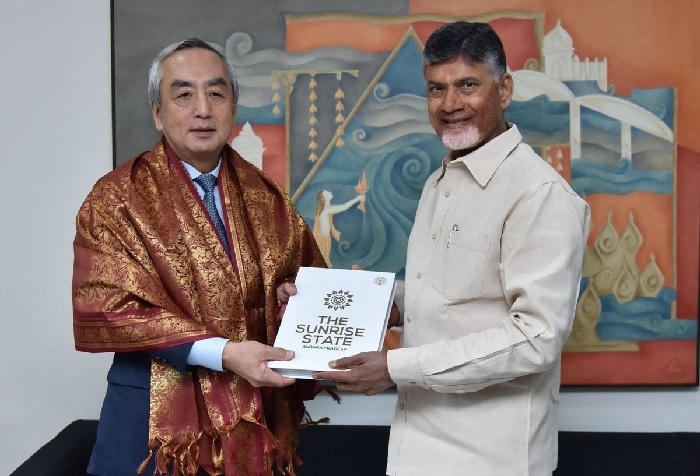 Amaravati, Aug 9: Kenji Hiramatsu, Japanese ambassador to India on Wednesday called on Andhra Pradesh Chief Minister Nara Chandra Babu Naidu at his official residence. On this occasion, besides Kenji Hiramatsu, representatives of five Japanese companies were also present. During this meeting, the Chief Minister briefed the Japanese delegation about various developmental initiatives of state government. According to an official statement, the business delegation led by Kenji Hiramatsu was impressed with the business ecosystem and also showed interest in collaborating with the coastal State. Hailing Japanese delegation, Naidu urged business leaders to conduct a study on the traffic and transport in Vijayawada city. The delegation will submit its report by November 2018. Babu hoped that new knowledge-based business ventures will generate employment in the state. The international delegation will help Andhra Pradesh government in housing and food processing sector the capital city area. In order to strengthen the ties with Japan, the state government is planning to introduce the Japanese language as a part of the curriculum in universities.